Notes from the Field: It’s a Girl! 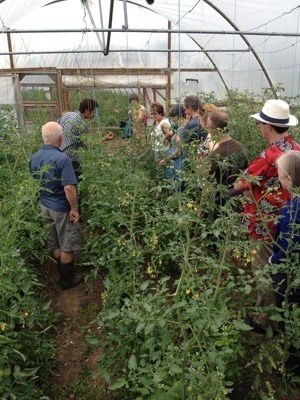 Over the weekend, we held our first Field to Fork customer event at the farm. It was a wonderful day and a real pleasure to meet our customers face-to-face. We swapped slug-deterring stories, cooked up a storm and harvested a courgette… or ten! We’re busy planning future customer events, so watch this space for your next opportunity to get your hands dirty and your stomachs full on the farm. Out in the fields, our tomatoes are starting to come through and the courgettes are in full swing (click here for plenty of courgette recipe ideas). We’ve got our first bit of green manure down and we’ll add to this over the next couple of weeks. We use fast-growing green manure plants to cover bare beds during their ‘rest period’ of the crop rotation, as they help to return valuable nutrients back into the soil and improve its structure. On Saturday, we finally christened our tractor and… it’s a girl! A generous crowdfunding donor was rewarded with the chance to name our tractor and she requested that we name it after the youngest female member of our community. 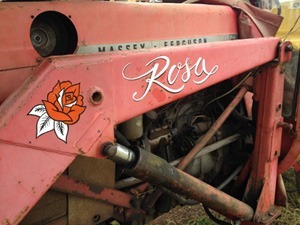 That little girl happens to be Rosa, the daughter of one of the farm’s founders, so our tractor now proudly bares her name.